January 30, 2014 at 12:00a.m. Lil Baby Cakes opened earlier this month, making things sweeter in Canfield. 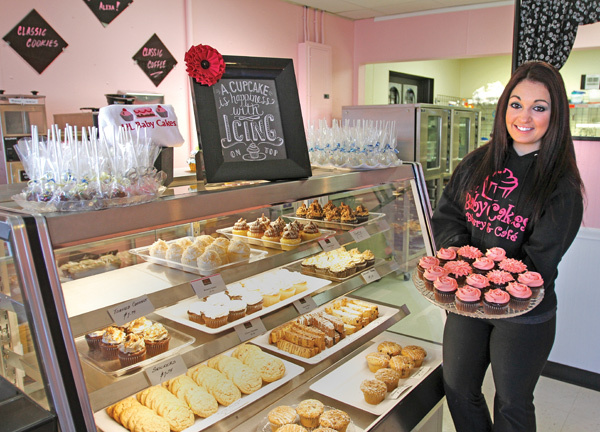 Alexa Diana, 19, of Austintown takes pride in her perfectly iced cupcakes and cakes. Life just keeps getting sweeter for Alexa Diana. She is a proud 19-year-old perfectionist baker who just opened her own bakery in Canfield, and her goals with the new business venture continue to tier. “I would live here if I could,” she said of her new bakery on Lisbon Street in Canfield. Alexa’s bakery, “Lil Baby Cakes,” opened Jan. 18. The idea of a bakery became a reality after Alexa’s father went into the former Caffe Dar’s looking for mixing bowls and came out with a bakery for his daughter, who developed a passion for baking that prospered into a full-blown business. The Dianas, of Austintown, always taught their three children, Alexa and her two brothers, to love what they do. Now, Alexa is doing just that. She takes orders weeks to months in advance for everything from birthdays to graduations and weddings. Donning her black sweat shirt emblazoned with “Lil Baby Cakes” in hot-pink letters, Alexa smiles at everyone who walks in the door for a tasty treat. The friendly, light pink walls and cupcake decor invite customers to a dream world of cupcake paradise. This is definitely a statement Alexa takes to heart. She makes sure every cake and cupcake displayed has the perfect look. Even though she has plenty of help in the kitchen, she is the chief and only person allowed to ice. “I don’t know what it is, I feel like I need to be watching,” she said. She is very thankful to have a supportive family backing her business goals and mixing her cake batter. She even has taken some tips from her Italian family members on making biscotti. In the future, she plans on throwing in some canoli and, for the weight-watchers, some low-fat, low-sugar or sugar-free treats. When the low temperatures end and flowers start to spring, she plans on trying some fruity flavors and maybe even a margarita flavor. Right now, the Reese’s Cup cupcake is the fan favorite. Other flavors include chocolate caramel, Snickers, banana, chocolate, vanilla, and the list goes on. The future growth of her business for locations and space is unknown, but Alexa is content spending all day, and oftentimes night, in the kitchen crafting her unique cakes. “It’s perfect for now,” she said. Lil Baby Cakes is open from 10 a.m. to 6 p.m. Tuesday to Friday and 9 a.m. to 2 p.m. Saturday. The bakery is closed on Sunday and Monday. For more information on Lil Baby Cakes, including flavors, go to lbabycakes.com. January 25, 2012 12:15 a.m.